Sure. I’d like to live regular. Go home to a good looking wife, a hot dinner, and a husky kid. But I guess I got film in my blood. I love this racket. It’s exciting. It’s dangerous. It’s funny. It’s tough. It’s heartbreaking. 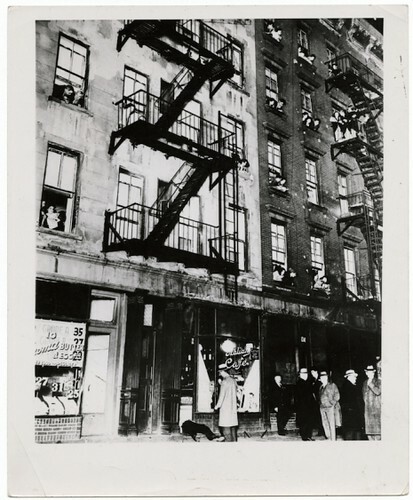 Weegee wanted his pictures to show some humanity. He walked back about a hundred feet. Set up his camera. Used flash powder and Kazam! There was the whole scene. The corpse. The blood. The cops. The balcony seat of people looking out to see what had just happened. Drama. Humanity. Crime. Weegee came out of Złoczów now part of the Ukraine. He was born Arthur Fellig in June 1899. He emigrated with his family. They landed New York 1909. Lived in the Lower East Side. His father was a hatmaker and part-time rabbi. Weegee took whatever work came. He became a janitor. Got the nickname “Squeegee Boy.” He hung around with the bums on the Bowery. Started taking photographs. First passport pictures, then commercial work. At the age of thirty-five, he upped his game, quit commercial work, became a freelance news photographer. As we snap it up, we might send pacific birthday greetings to Mildred Lisette Norman; she was born on this date in 1908. 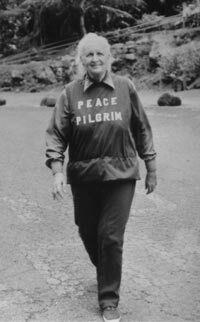 Better known by the descriptor she gave herself, “Peace Pilgrim,” she was a non-denominational spiritual teacher, mystic, pacifist, vegetarian activist, and peace activist. In 1952, she became the first woman to walk the entire length of the Appalachian Trail in one season; she then walked across the United States to speak with anyone she encountered about peace– and journey that lasted for 7 cross-country round-trips over 28 years.